OSTEOPOROSIS: WHO, WHAT, WHEN, WHERE, WHY? It’s tempting to think of bones as inorganic, lifeless structures in your body that serve no purpose other than to hold you together and keep you standing. However, that couldn’t be further from the truth! Bones aren’t just made of minerals, but also consist of living cells that adapt and respond to stress over time, subtly changing the internal structure of the bone to more effectively resist forces. Our bones are also dynamic storage sites, releasing or trapping minerals such as phosphate and calcium in response to hormonal changes. Bones are vitally important organs but, as with any body part, they do wear down with age. People’s bones lose density over time, which can result in osteoporosis. 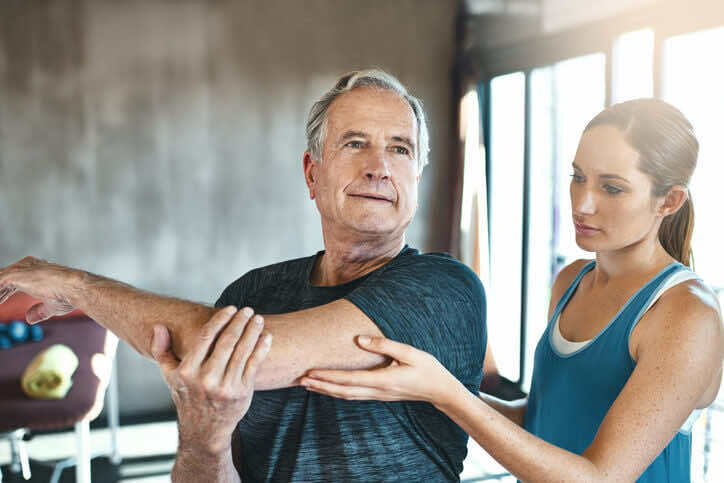 In this article, our doctors here at London Doctors Clinic run you through everything you need to know about osteoporosis! These are mainly caused by falls that would not normally cause a broken bone in a healthy individual, but can result in a fracture in those with osteoporosis. These fractures may require surgery to be repaired, and hip fractures are particularly associated with a difficult recovery. This tends to be because people with osteoporosis are older, and have other medical concerns which affect recovery and rehabilitation. Spinal fractures do not typically cause paralysis but, because the fractured vertebrae do not heal perfectly, they can result in a shortened and curved spine – a ‘dowager’s hump’. Despite this increased fracture risk, there are treatments available to limit this – as well as ways to prevent developing osteoporosis in the first place. The most significant factor in developing osteoporosis is age. While only 2% of women aged 50 suffer from osteoporosis, over 25% of women have the condition at 80. Being female is another major risk factor for osteoporosis. This is because the hormone oestrogen is directly linked with maintaining adequate bone density, and levels of this hormone plummet after menopause. Other causes of reduced oestrogen can also contribute to decreased bone density, such as having a hysterectomy (which can cause early menopause) or losing your periods for over 6 months due to weight loss or extreme exercise. Certain contraceptive methods also decrease oestrogen levels, but there is limited evidence to suggest that they lead to osteoporosis. If you have any concerns about a medication that you are taking, make sure to speak with your GP or private doctor. Other than an increased fracture risk, there is no way of knowing you have osteoporosis without medical tests. Osteoporosis itself is silent, with no felt symptoms. Nevertheless, your GP should consider assessing your risk of osteoporosis as you age – over 65 for women and over 75 for men. Doctors can use special prediction tools, such as FRAX or QFracture, to calculate your future risk of having a fracture in the next 10 years. This works by looking at any risk factors you may carry, such as higher age, being female, or smoking. Depending on the results of the assessment tools, your GP may ask that you go for a DEXA scan. This is a special type of scanner which uses x-rays to measure bone density. Osteoporosis can be treated with medications, which will reduce the risk of breaking a bone. The most common type of drug used are the bisphosphonates, the most often used example of which is alendronic acid. These drugs slow the rate of bone breakdown, which is a natural step in bone growth and maintenance. However, concerns have recently been raised regarding the efficacy of bisphosphonates in Osteoporosis. Patients with osteoporosis are also often given Vitamin D (cholecalciferol) and calcium supplements. If these medications are not working effectively, there are many more drugs that your GP can prescribe to treat the condition. Particularly elderly patients, or those with limited mobility, may also be referred to occupational therapy. They can carry out a falls assessment, helping to adapt your surroundings to reduce the risk of falling at home. While osteoporosis is associated with increasing age and the menopause, there are things that younger people can do to reduce their risk of developing it. As mentioned before, bones are dynamic structures that adapt to the forces and stresses applied to them. By putting force through the bones by means of weight training or resistance exercises, you can increase the density and strength of your skeleton. Just as aerobic exercise is important to keep the heart and lungs healthy, resistance training is important to maintain good bone health. As always, exercise goes hand-in-hand with diet; a healthy, balanced diet that is rich in sources of calcium (yoghurt, leafy greens) and vitamin D (red meat, oily fish) can also help reduce the risk of osteoporosis. Remember, responsible and safe sun exposure is important to trigger your body’s own production of Vitamin D. Other handy preventative measures include cutting down on alcohol and quitting smoking – two steps which will improve your health in many other ways as well. If you want to learn more about what causes osteoporosis, how to prevent it, and how it is treated, you can check out the NHS Choices website or the National Osteoporosis Society website – a UK charity that also operates a Freephone support helpline. Should you wish to discuss your concerns with a GP, why not book an appointment with LDC? We have 8 central London clinics, with appointments available 7 days a week, so we should never be too far away when you are in search of a doctors surgery or “doctor near me“. Our GP’s are always able to address any concerns and answer any questions you may have about this condition (or anything else that is on your mind).